Home > Shop by Brand > Pinnacle Natural Brilliance > Pinnacle Black Label Collection > Pinnacle Black Label Hide-Soft Leather Cleaner 32 oz. Gently clean all leather surfaces including unfinished aniline! Don't just clean your leather, pamper it in a bath of nourishing lanolin and mink oils with Pinnacle Black Label Hide-Soft Leather Cleaner. Your automobile's leather surfaces are delicate. Without proper upkeep, they will age just like skin. The most common cause of aging is embedded dirt and body oils which abrade and change the pH of leather. 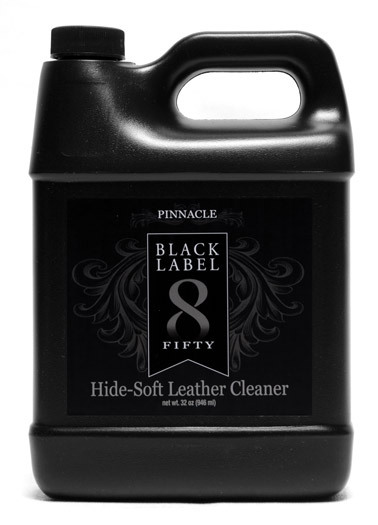 Pinnacle Black Label Hide-Soft Leather Cleaner gently penetrates and lifts any harmful contaminants from the leather without damaging or drying it out. Pinnacle Black Label Hide-Soft Leather Cleaner features a pH-balanced solution of non-alkaline surfactants, gentle cleansers, as well as lanolin and mink oil, which gives it an intoxicating natural-leather scent. This luxurious leather shampoo quickly removes grease, body oil, and organic grime from leather while restoring its natural pH. As the cleaners work, Pinnacle Black Label treats the leather to a luxurious bath of natural oils to prevent drying out and cracking. Automobile leather comes in three finishes: pigmented, semi-aniline and the ultra-delicate aniline. Pinnacle Black Label Hide-Soft Leather Cleaner is safe for all leather types, except suede. On pigmented and coated leathers, Hide-Soft Leather Cleaner gently cleans the coated surface while the nourishing oils penetrate any microscopic tears to nourish the hide underneath. Unlike the harsh petroleum-based cleaners typically used, Pinnacle Black Label Hide-Soft Leather Cleaner will penetrate and float dirt out of delicate non-finished aniline leather. Pinnacle Black Label Hide-Soft Leather Cleaner is ideal for use on any leather surface found in your garage or around your house. It is the ideal cleaning solution for jackets, driving gloves, and more. Additionally, Pinnacle Black Label Hide-Soft Leather Cleaner's pH-balanced solution is excellent for cleaning vinyl and soft-touch plastics. Vacuum and remove any dirt or loose debris prior to cleaning. Apply Hide-Soft Cleaner to a terrycloth or microfiber applicator pad and gently rub into the surface. Remove excess cleaner with a soft microfiber or terrycloth towel.Repeat for heavily soiled surfaces. If cleaning unfinished aniline leather, found on certain Ford King Ranch models and classic cars, some discoloration will appear. This is normal and an even finish will return as the leather dries.